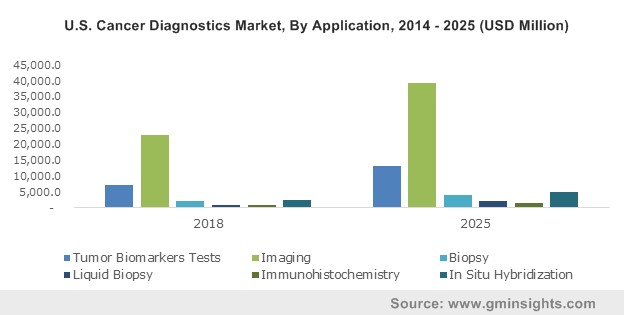 Cancer Diagnostics Market size was valued over USD 84.1 billion in 2016 and is expected to witness more than 8.1% CAGR from 2017 to 2024. Rising incidences of cancer along with growing awareness about early disease diagnosis and prevention will drive the market over the forecast timeframe. Growing geriatric population base, prone to suffer from several ailments will act as high impact rendering factor for industry growth. Technological advancements in target disease screening tests along with numerous initiatives undertaken by WHO and domestic government to reduce disease prevalence will positively impact the global market growth. Growing adoption of western culture, unhealthy food habits and physical inactivity has escalated number of people suffering from various chronic diseases such as cancer. Increasing R&D funding for developing advanced cancer diagnostic and therapeutic products to control disease prevalence coupled with growing disease awareness will fuel business growth. However, high cost associated with cancer diagnostic tests will hinder the market growth over the forecast timeframe. Cancer imaging held largest market share in 2016 and is anticipated to follow similar trend during the forecast period. Availability of non-invasive rapid imaging modalities such as magnetic resonance imaging (MRI) along with several applications of imaging in disease management from diagnosis to treatment will drive cancer imaging market over the forecast period. Imaging is also used in assisting radiography and surgery coupled with identification of structural and cancer related changes. Liquid biopsy market size will witness robust growth over the forecast timeframe. Growing demand for minimal invasive procedures, rising prevalence of cancer along with availability of funding for liquid biopsy R&D will drive industry growth over the coming years. Breast cancer segment is estimated to witness significant growth during the forecast period. Rising incidences of breast cancer, growing disease awareness and early detection coupled with favourable government initiatives to reduce disease incidences will drive market growth. Favourable reimbursement policies related with breast cancer screening and treatment will fuel industry growth. Growing geriatric population base will act as primary driver for prostate cancer. According to American Cancer Society, 6 in 10 cases of prostate cancer is observed in men older than 65 years of age. Rising incidences of target disease and growing awareness will drive market size growth over the forecast timeframe. Hospital segment will witness robust growth over the forecast period owing to availability of latest technologies in hospitals along with skilled healthcare professionals. Presence of numerous reimbursement policies and healthcare coverage provided in the U.S. hospitals for cancer prevention and early diagnosis will drive business growth. Cancer research institutes segment will experience considerable growth over the forecast timeframe. Growing demand for rapid, user friendly cancer diagnostic kits has stimulated growth in R&D investment by government as well as market players. Numerous industry players partner with cancer research institutes to strengthen its R&D, assisting in new product development. U.S. dominated cancer diagnostics market in 2016 and is expected to grow with more than 8.0% CAGR. Growing geriatric population, high cancer prevalence rate, and rising awareness about early disease diagnosis and prevention will drive U.S. market. Growing healthcare expenditure by government as well as individual coupled with favourable reimbursement policies will positively impact market growth. Germany market will witness lucrative growth over the forecast timeframe. Well-developed healthcare infrastructure, increasing number of people suffering from cancer and growing disease awareness will drive market size growth. Rise in R&D expenditure in Germany to develop new rapid and accurate cancer screening and treatment products will favour industry growth. Increasing number of baby boomers coupled with rising incidences of cancer will drive Japan market over the forecast period. Rising healthcare expenditure, and growing awareness about early disease diagnosis will positively impact market growth. 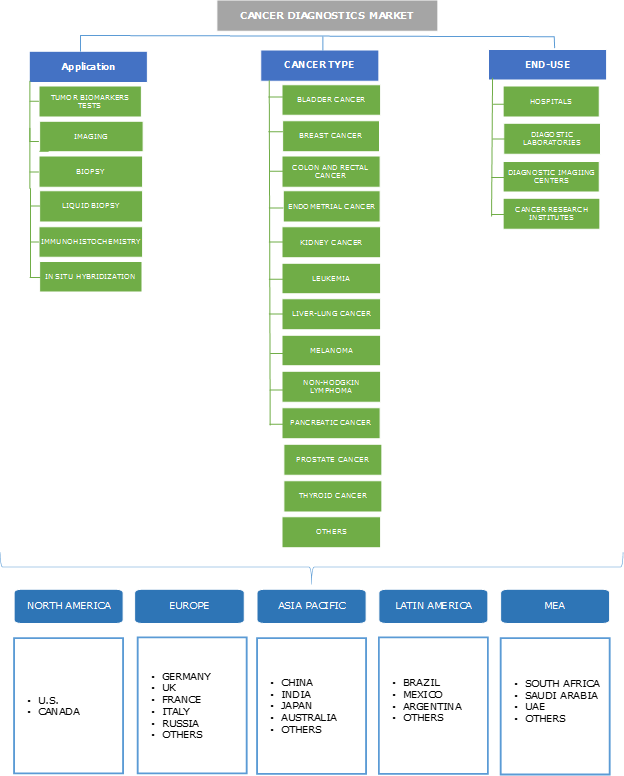 Some of the major players of global market are Roche, Abbott, Siemens Healthcare, GE Healthcare, Danaher Corporation, Becton, Dickinson and Company (BD), Janssen Diagnostics and others. Industry players are focusing their efforts towards developing new cost-effective, user friendly cancer screening products to satisfy growing consumer demand. Several industry players are partnering with research institutes to accelerate and broaden its R&D capability. Increasing number of baby boomers coupled with growing awareness about cancer will drive the market over the forecast timeframe. Rising number of cancer incidences globally due to unhealthy diet and growing adoption of sedentary lifestyle will fuel industry growth. The rising demand for cost effective, and rapid cancer diagnostic tests has led to increasing R&D investment by market players and government to satisfy growing demand. Favourable initiatives undertaken by government to create disease awareness and control disease occurrence rate will positively impact market growth. Excessive cost associated with current oncology detecting products in the market will hinder cancer diagnostics market over the coming years.